WE’RE BACK. Yesterday, after 17 days in Thailand and Vietnam, 30 consecutive hours of flying, a 2-hour drive to Milwaukee, and an emergency pizza run (TRUTH), Ben and I arrived home. I’m exhausted, exhilarated, and my body can’t tell day from night. Please pass me the Crockpot Lasagna Soup and a cup of coffee. Or a sleeping mask. Have I mentioned that I’m not sure what day it is? Our trip was…how do I explain this without sounding completely cliché, nondescript, and vague? Amazing? Accurate, but cliché and vague. Horizon-expanding? Still true. And cliché. And vague. Two weeks that pushed me to my limits, broke and rebuilt my heart, and overwhelmed me with its colors, its flavors, and its soul? Better, but still too far from telling you enough. To put it exceptionally mildly, I have a lot to process. Whether you are referencing my emotions, my laundry hamper, or my 5,978,462,539 unread emails, there’s a hefty amount of sorting to be done. Although it felt wonderful to truly disconnect these past few weeks—I often turned on my phone to see the words “No Signal” displayed in its upper lefthand corner—a piece of my heart stayed back here with this blog and each of you. I’ve missed my kitchen and sharing with you in real time. The beauty of technology meant that I could schedule several posts ahead while we were away (hello, PISTACHIO TRUFFLES), but nothing feels quite as good as hitting “Publish” and knowing that you’ll be seeing the recipe almost as soon as I do. 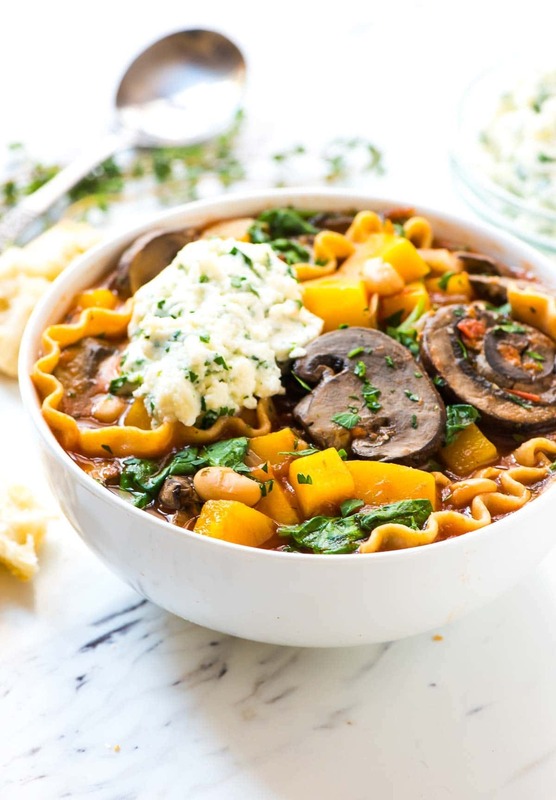 My first recipe now that we’re back at home, this scrumptious Crockpot Lasagna Soup is the sort of easy and healthy meal that will be my anthem in the coming weeks of general holiday crazy and mass cookie consumption. 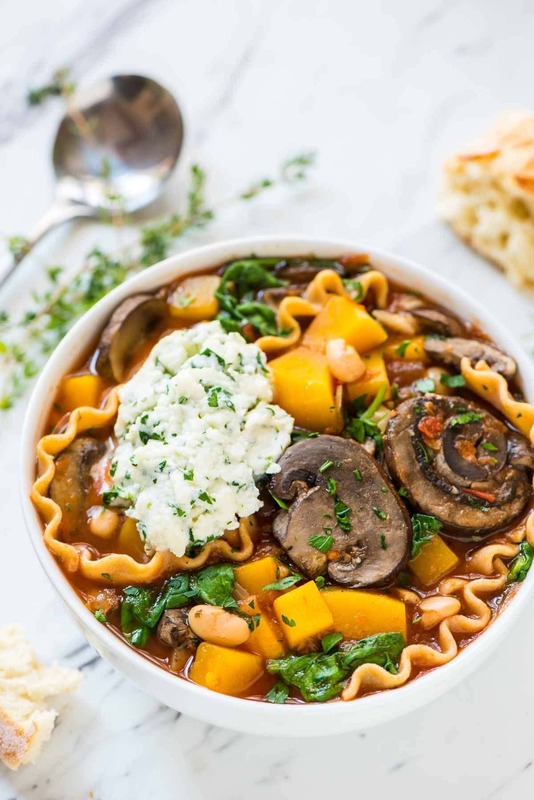 Made with butternut squash, mushrooms, whole wheat noodles, and a splash of white wine, this slow-cooker vegetarian lasagna soup has wonderful flavor, but it is completely hands-off to prepare. The ingredients go into the crock pot, and you go on your merry way. Return a few hours later to find your kitchen perfumed with garlic and tomatoes and your cozy meal ready to serve. 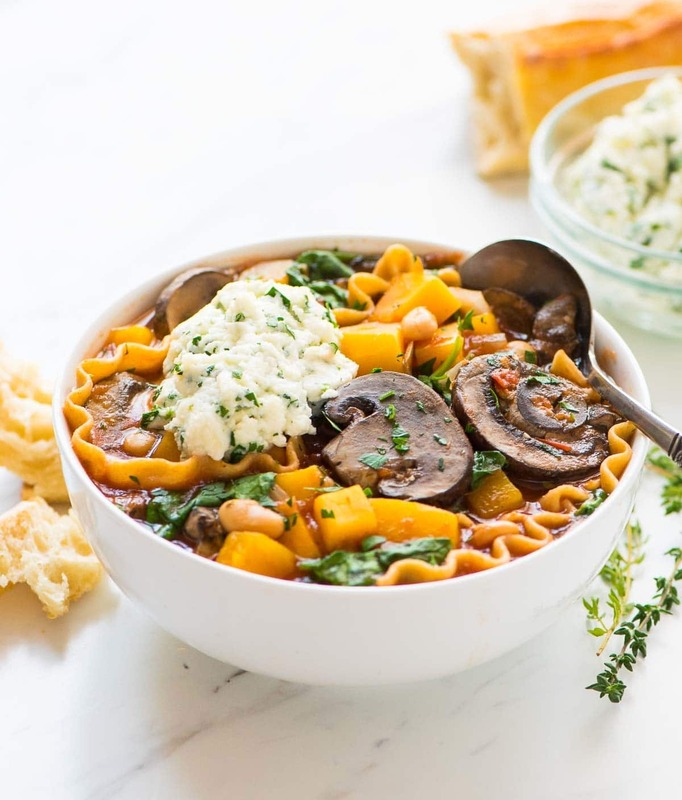 This Crockpot Lasagna Soup does have one, highly important final step we need to discuss: the cheesy herb ricotta topping. Do you see that creamy dollop on top of the bowl? You must, MUST add it. 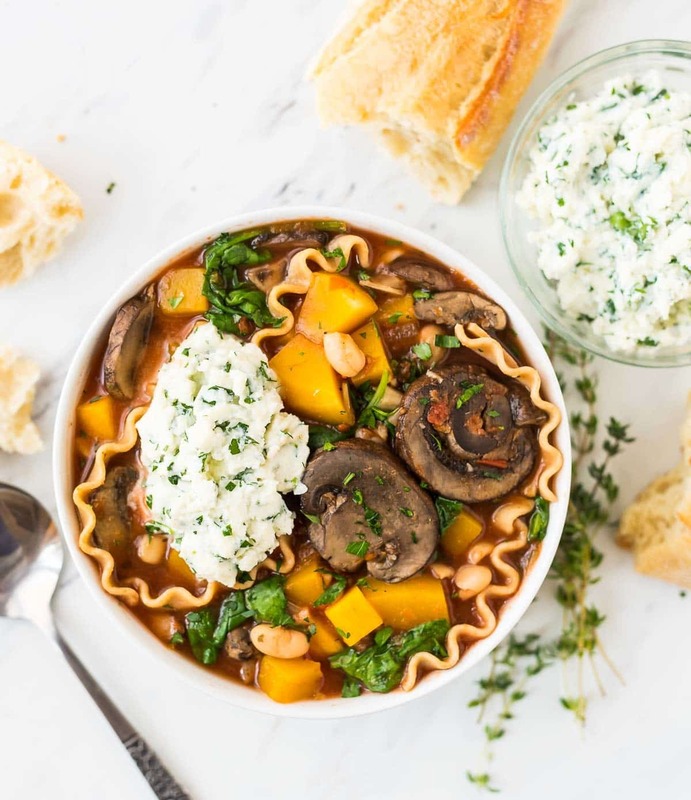 A blend of ricotta cheese, mozzarella, and fresh herbs, it melts into the lasagna soup, makes it wonderfully creamy, and gives the recipe its true “lasagna” taste. I tried one bowl of this easy lasagna soup with the ricotta topping and one without, and believe me, you do not want to be without it. The ricotta topping will last several days in the refrigerator, so it’s easy to make ahead, and you can enjoy a scoop with each bowl of your leftovers too. The lasagna noodles are fun and theme-appropriate, but you can certainly swap in a different pasta shape you prefer or have on hand. Also, because the noodles are cooked and added just before serving, this Crockpot Lasagna Soup recipe is a great way to repurpose leftover pasta noodles too. Easy Crockpot Lasagna Soup. Tastes like lasagna, without the layering or dishes! A healthy slow-cooker vegetarian soup recipe your whole family will love. To a 6-quart or larger slow cooker, add the butternut squash, mushrooms, onion, beans, garlic, bay leaves, salt, pepper, crushed tomatoes, and 4 cups broth. Cover and cook for 6-7 hours on low or 3-4 hours on high, until the squash is tender. In a small bowl, stir together the topping ingredients: ricotta, mozzarella, parsley, and kosher salt. Cover and refrigerate topping until ready to serve. Once the soup is ready, remove the ricotta mixture from the refrigerator and let it come to room temperature. Bring a large pot of salted water to a boil and cook the noodles until al dente, according to the package instructions. Drain the noodles, then rinse and cut into bite-sized pieces. Remove the bay leaves from the slow cooker. Add the spinach, white wine, thyme, and cooked noodles to the slow cooker. If the mixture seems too thick, add additional vegetable stock to reach your desired consistency. Stir just until the spinach wilts. Serve warm, topped with a dollop of ricotta cheese. I’m so glad you had an amazing trip!! I was living vicariously through you on Instagram. ;) This recipe looks like the ULTIMATE comfort meal after so much traveling. Or the ultimate comfort meal for anytime! i cant wait to hear all about the trip. sometimes that no signal sign is good for our body, mind, and soul. I completely agree, Dixya. I can’t wait to share more! Welcome back, Erin. We’ve so missed you but know you wouldn’t have traded the traveling experience for anything. Awh, thank you so much, Sarah! To lower the carb count, do you think spaghetti squash could substitute for the pasta? Hi Judy, I’m not sure the spaghetti squash texture would be quite right here. You could certainly experiment if you like, but the soup would still be great if you simply omit the noodles! I heartily echo the sentiments of those who posted before me! Thank you for what looks like love and goodness in a bowl! Please give us more vegetarian dishes to make in a slow cooker! Thank you, Carolyn! I’ll definitely keep that in mind! hey girl glad your back! I know y’all had a lot of fun! This soup looks yummy! This might be the prettiest thing I’ve seen come out of a slow cooker in, well, forever. LOVE all of the yummy winter veggies and, of course, that ricotta topping! YUM! Another home run! This was really well received by my family of 6. I had JUST enough room to double it for my crockpot. The only things I changed was adding browned ground venison for more protein, and setting out the lasagna noodles separately and then they poured the soup over amd mixed it in. Now it goes in my permanent “keeper” file! Thanks again! Saralee, I’m so glad to hear this recipe is a keeper for you! Thanks so much for this nice review and the notes! I made this the other night and it turned out so good! I don’t have a slow cooker, so I just made it on the stove. I just sauted the onion first, and then followed the rest of the recipe. The cheese mixture was my favourite part as it made the soup really creamy. I cut the recipe in half as it’s just me and my husband, and we had leftovers for dinner the next night. I’ll definitely make this again! HOORAY Zoe, I’m happy to hear this soup was a winner for you! Thanks for giving it a try and leaving this fabulous review! Do you think you could replace the cannellini beans with chickpeas to increase the protein content of this soup? It looks delicious & I’m hoping to try it soon!! Hi Samantha, I haven’t tried that myself but I don’t see why you couldn’t. I hope you enjoy! How much would you say is a serving? Hi Annie! I got about 6 servings from the whole recipe. I didn’t measure an exact volume, so you’ll want to eyeball about one-sixth of the soup for each. I hope you enjoy it!